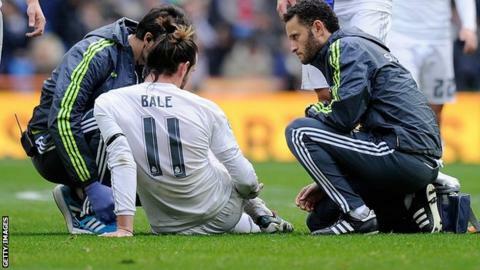 Real Madrid forward Gareth Bale has suffered his third calf muscle injury of the season. Bale, 26, limped off shortly before half-time during Real's 5-1 La Liga win at home to Sporting Gijon on Sunday. The Wales international, who has scored 13 goals in Spain this season, is reportedly set to be out for three weeks. "He has been diagnosed with a soleus (calf) muscle injury in his right leg," Real said on their website. Reports in Spain suggest Real are hoping to have Bale back for the last-16 Champions League tie against Roma on 17 February. Bale has missed eight games over two separate spells this season because of calf injuries. He was criticised in the Spanish media after suffering a recurrence of the original while playing for Wales against Andorra in October. Since returning to fitness at the beginning of November, he has scored 11 goals in as many games for Real.